Shop deals on amazing slim fit clothing for men. If you're a young man who favors fashion, you know what slim fit clothing is all about. You as a young man simply aren't going to wear any thing else except slim fitting clothing and suits when it comes to your lifestyle and young men's fashion needs. 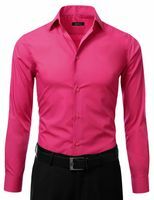 You need a store that specializes in slim fit clothing that makes you look your best. Here at ContempoSuits.com, you'll find our huge selection of affordable slim fit suits and extra slim fit suits, slim fit dress shirts and slim fit dress pants all designed for the young man and quite pleasing to the way you like to dress and your wallet as well. We're the online slim fit suit store that has got you covered. You'll find the quality of our slim fit suits to be top notch for the low prices you'll pay. 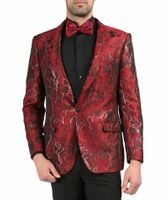 Slim Fit Suits and extra slim fit suits allow you to make the right moves when you are wearing the right fitted mens clothing when dressing to impress is tantamount to your success. The right looking mens slim fit suits are the new style for the younger fashion forward young man who favors the trim looking style over all. Our Mens Slim fit suits are sold cheap and are the new style for a new generation of young men who favors the more Fitted or Skinny style. We sell shiny styles and regular fabric styles as well. Add some serious Celebrity style to your club wear by being seen in Slim Fit Blazers. These slim fit jackets are just the thing to wear for young men when style and fashion is of the utmost importance. You'll find a very nice selection of these slim fitting jackets ready to roll with your flat front pants all designed for the young man under 30 who simply won't be seen wearing anything that isn't slim fit. Slim fit tuxedos and prom suits have the style and attitude that young men simply must have in their their Prom tux. When that special occasion arrives, there is no sense in wearing a Prom tuxedo that isn't slim fit. Slim fit tuxedos feature tighter fitting jackets and no pleat slim fit pants ready for the camera and the Prom you're going to. Slim fit dress pants reflect the style that the modern younger man is seeking with it's fitted look that says that these aren't his father's dress pants. You'll quickly see that slim fit dress pants bring the early 1960s back.